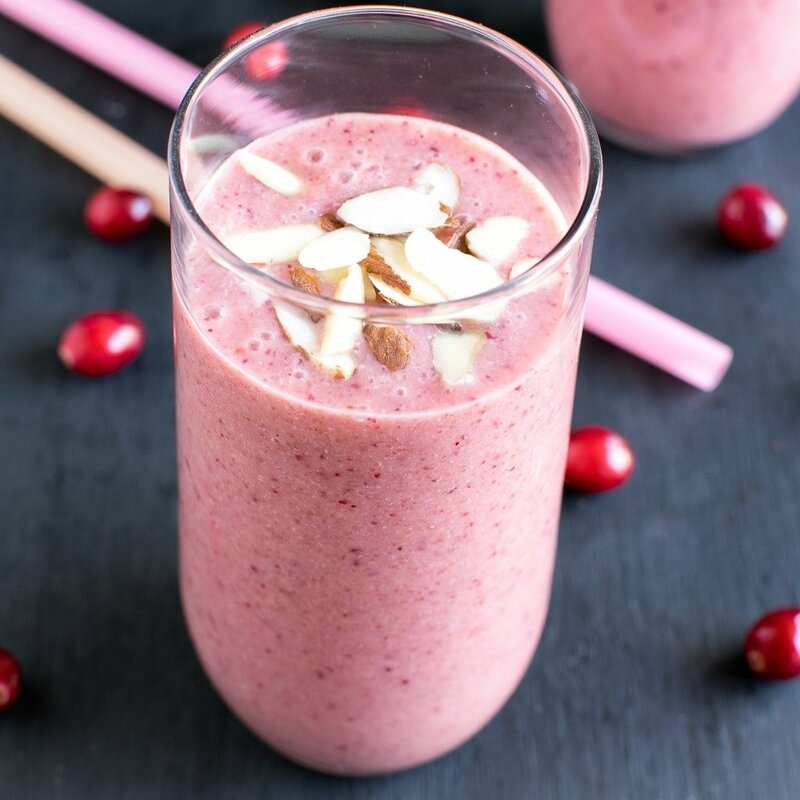 Cranberry Amaranth Smoothie is a replenishing beverage packed with deliciousness and health. The beautiful pink color of this smoothie is attractive even to kids. Hence, it is recommended for all age groups. It is desirable as a healthy meal or after workout drink. 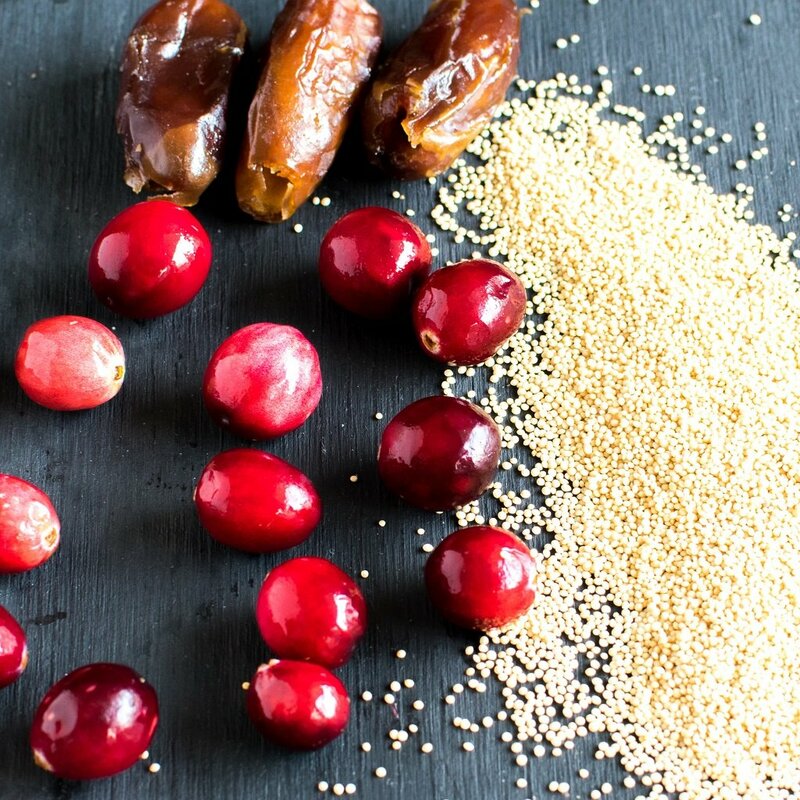 The combination of cranberries and healthful ancient grains make it super nutritious and desirable. You may enjoy Cranberry Amaranth Smoothie in a glass if you plan to consume it immediately after blending. However, if you want wholesome breakfast then let it sit for a few minutes. s a result the smoothie will thicken. Thereafter top your smoothie bowl with your choice of fruits and nuts and devour. This smoothie is mildly sweetened with dates. it also has a distinct flavor of cranberries. The chewy amaranth provides you with the satisfaction of chewing meal. Therefore, this smoothie is perfect to satisfy and provide energy in the morning hours. Moreover smoothies are perfect for hydrating at any time of the day. I always prefer smoothies after my heavy workout. This way I not only hydrate my body but provide it with the much required nutrition. I always try to include seasonal fruits and vegetables in my smoothies. This time, I included a healthy grain to make it a complete breakfast. Amaranth is a gluten free gain and is a complete protein. In fact it has more protein than quinoa and is one the healthiest grain ever. It is simple to cook as well. I blended cooked amaranth in this smoothie to give it a thick creamy texture. The most important benefit of Amaranth is that it helps in controlling hair fall. It is also a good source of calcium. Amaranth is easily available in any grocery store in the health aisle section. It is the tiniest grain with immense health benefits. Cranberry Amaranth Smoothie is my go to meal for this season. Fresh cranberries in nature are extremely sour and tangy. Therefore, it is difficult to consume these berries directly. I am happy that I found a great way to include this antioxidant loaded cranberries into my diet without compromising on taste. 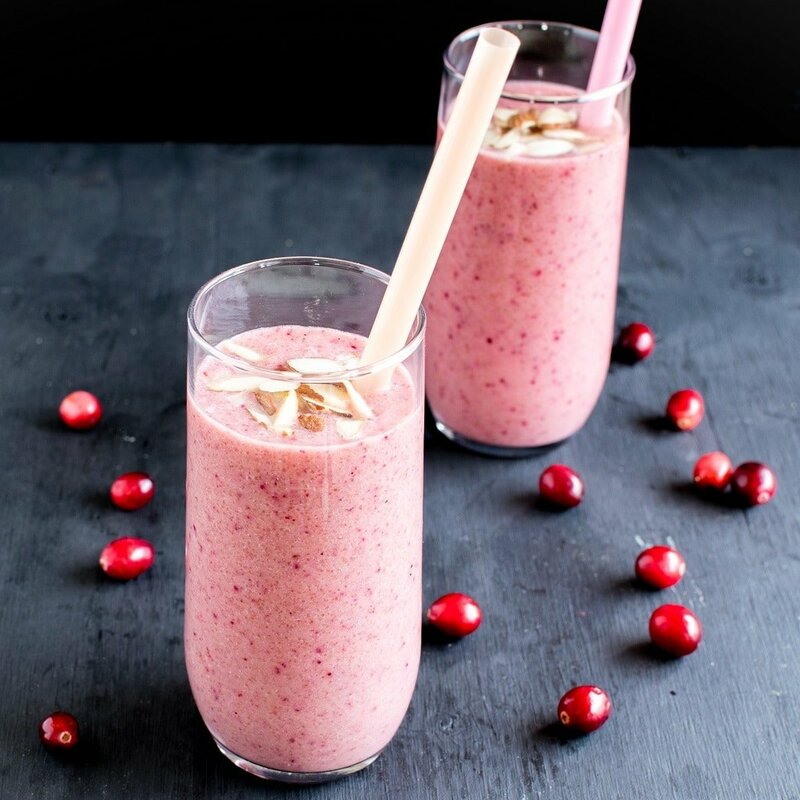 Cranberry Amaranth Smoothie is a replenishing beverage packed with deliciousness and health. You may enjoy it in a glass or in a bowl. It is loaded with antioxidant, protein and calcium. In a saucepan combine water and amaranth. Then cook it on a medium flame until all water is absorbed and amaranth is chewy in texture. Once it is cooked turn off the flame and let it cool. 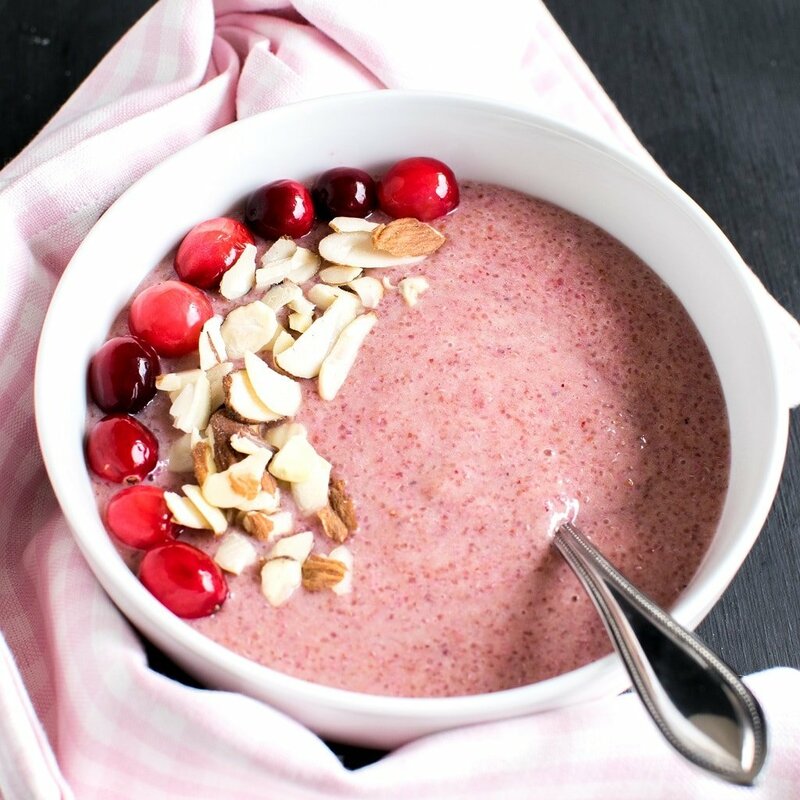 In your blender combine cranberries, cooked amaranth, dates and unsweetened almond milk. Thereafter, blend it smooth. Afterwards, pour the smoothie in your choice of glasses and garnish them with slivered almond. This smoothie may be enjoyed as a smoothie bowl as well. After blending, let it sit for a few minutes until it thickens. Thereafter, you may top your smoothie bowl with your choice of fruits and nuts. I love having cranberry foods this time of year! I’m glad you explained amaranth, because I had never heard of it before! Using amaranth in this way is totally brilliant. It is one of those gluten free grains I always cooked. Can’t wait to try your yummy smoothie. Thank you Sandi. I hope you get a chance to blend this smoothie.